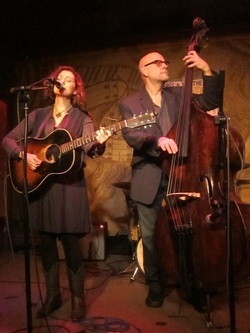 Born of her Eastern Kentucky roots and filtered through the sidewalks of Chicago, Jane Baxter Miller first made waves in the Chicago scene in the mid 1990’s with her folk/country duo Texas Rubies. They released one album,Working Girl Blues, and contributed a track penned by Jane, “That Truck,” to the inaugural Bloodshot compilation For A Life Of Sin. As a solo artist, she's contributed tracks to the compilations The Bottle Let Me Down, Poor Little Knitter on the Road and Hard Headed Woman, and sung on albums by Jon Langford, the Pine Valley Cosmonautsand Sally Timms. Harm Among The Willows, the solo debut by Jane, haunts and uplifts as it laments the heart broken and celebrates the heart released. It is an album of journeys and longings, both musical and emotional. Backing Jane and her acoustic guitar on Harm Among The Willows is a collection of locals that remind us why we’re lucky to live in Chicago. Gerald Dowd has drummed with the Robbie Fulks band, behind Nora O’Connor and in the Flat Five; guitarist Grant Tye spent years on the road with Robbie Fulks; bassist (and Jane’s husband) Kent Kessler records and tours the world with Vandermark 5, Peter Brotzman Tentet, DKV Trio and is a pioneer in the Chicago free jazz scene ; and the preposterously talented Scott Ligon (Kelly Hogan, Nora O’Connor, Flat Five and every other band that plays at the Hideout) kicks in some organ and piano work. Hers is a voice that captures the timeless ache that seeps up through the dirt and hills of her native Kentucky and evokes the spook and hope and wonder and joy of the forests and the moon. It’s a voice that can’t be taught and a voice that can’t be kept down, no matter how long she has made Chicago her home.